How the iPhone 6S Camera compares to the iPhone 6? If you take one glance at the specifications and features of iPhone 6S, you are most likely to notice the sensor on the back-facing camera of iPhone 6S. The significant change in the megapixels, from 8 megapixels to 12 megapixels, is noteworthy. For you to make the decision whether to upgrade from its immediate processor or not, you need to understand how the iPhone 6S camera compares to the iPhone 6. In the first place, the increase in the megapixels gives the iPhone 6S an obvious edge over iPhone 6. This provides you with more options to edit your photos creatively. Although you will be able to crop the photos by retaining the details, it does not give you much scope for zooming the photos without compromising the quality. However, there is a downside to adding more pixels to a small sensor. The details in your photos become quite messy and smudged. However, Apple has made changes to the image processing of the iPhone 6S. As a result, the dynamic range in the shots taken with iPhone 6S is noticeably better when compared to iPhone 6. There are also significant differences when it comes to iPhone 6S vs iPhone 7. If you are confused about how the iPhone 6S camera compares to the iPhone 6, take into account the front-facing selfie cam. Apple calls the front-facing selfie cam the FaceTime HD camera. When it comes to iPhone 6S, the resolution has been increased from 1.2 to 5 megapixels. The feature of live photos works on both the back-facing and front-facing cameras. In addition, you will be able to take HDR shots on both these cameras. Moreover, there is also a flash on the front-facing camera on iPhone 6S. When it comes to the flash, iPhone 6S does a much better job than iPhone 6. If you want to understand how the iPhone 6S camera compares to the iPhone 6, you will also need to keep in mind the additional camera specifications. Because of the increased resolution of iPhone 6S, the panoramas have now become bigger. All credit goes to the A9 processor of iPhone 6S. Nonetheless, the burst mode on the camera of iPhone 6S does suffer because of the increase in resolution. However, the speed of iPhone 6S is far greater than that of iPhone 6. In case you need to know how the iPhone 6S camera compares to the iPhone 6, you need to keep in mind all the specifications. The new option to explore is the live photos. Once you turn on this option, your iPhone is going to capture 1.5 seconds of footage when you press the shutter. Although Apple is trying to point out that the live photos are not videos, it is a .mov file. Once the live photos are shot, you will be able to activate them with audio using the 3D touch. Also, you can set it as a wallpaper on your Apple watch or iPhone. Nevertheless, sharing is still messy when it comes to the live photos. You can now shoot videos on iPhone 6S in 4k. 4k, also known as the full HD, is actually four times the resolution of 1080p. When it comes to editing the videos, you can have much more creative control with iPhone 6S. Also, cropping the videos becomes incredibly easier with the camera of iPhone 6S. 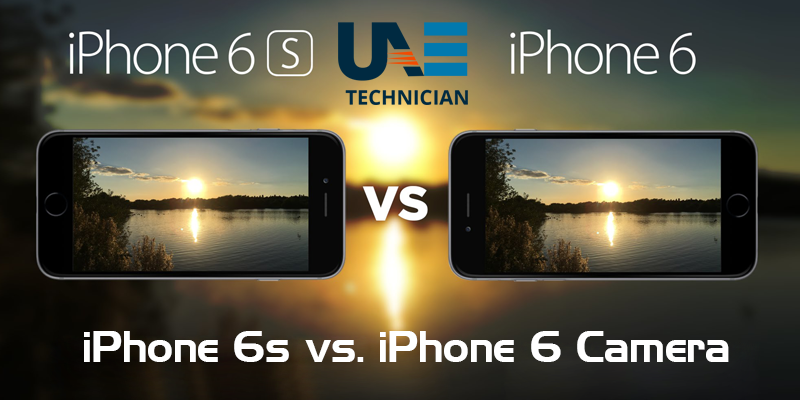 Are you still confused about how the iPhone 6S camera compares to the iPhone 6? You can get in touch with the experts at UAE Technician by calling at 042053349 . Additionally, we can also let you know the best iPhone 6S price in UAE. Moreover, we can also help you understand the iPhone 6 vs 6S price and assist you in understanding the specifications of the cameras. Therefore, get in touch with the professionals and avail exceptional services in your budget.